Ask for user confirmation before executing a script? 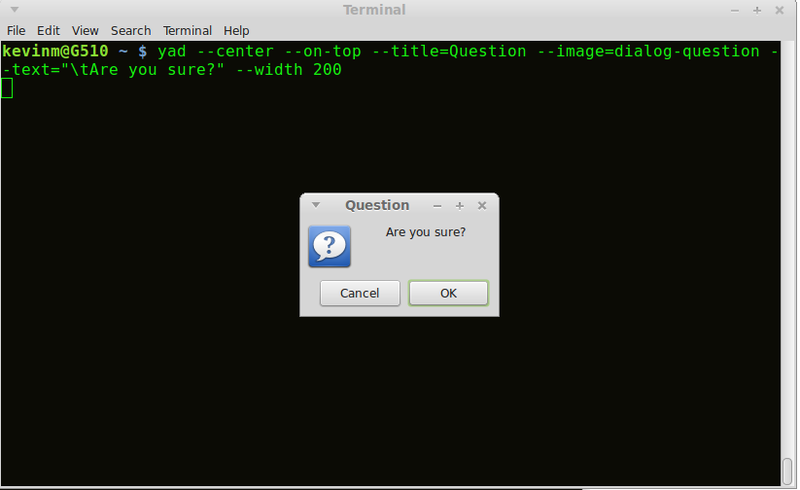 zenity --question --text "Are you sure?" if zenity --question --text "Are you sure"
zenity --question --text "Are you sure?" || echo "User isn't sure:/"
This will display a graphical message saying "Are you sure?" with an "okay" button. 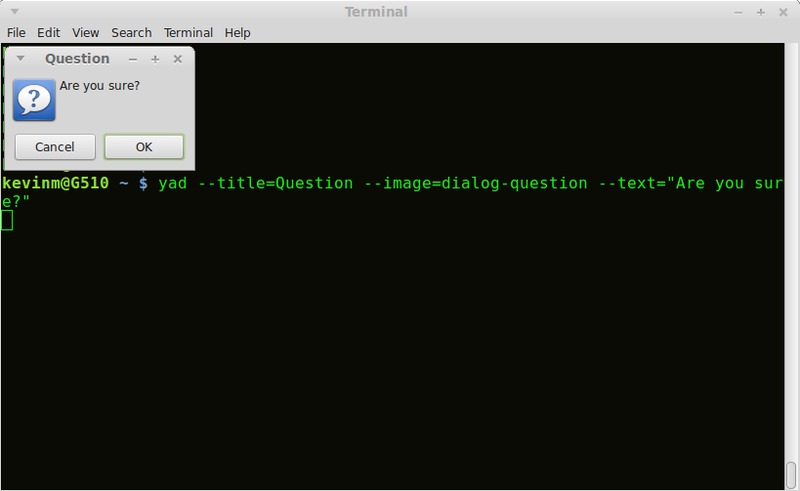 You can configure xmessage to have more than one button and change what's written in it. You can also configure the actions done by each button. xmessage -buttons ok:0,cancel:1 "Are you sure?" See man xmessage for all the options (there are lots of them). Instead of telling you how to do it, I will tell you that you should not be doing that. TL;DR - Do not change your script. Instead configure your file manager or figure out why your users accidentally run it. EDIT: You seem to treat your script as somehow special, as if the general settings are not good enough and your script needs special confirmation from the user. Double clicking on it is the confirmation. If you find that your users run it by accident then you have to figure out why they do it and solve that instead. Then your real problem is not how to require confirmation but how to prevent your users from running it accidentally. and shove it in /usr/local/share/applications/your-script.xml or ~/.local/share/your-script.xml. Since you are double clicking on the script, it's the job of your file manager to confirm this. It is not the job of the script to confirm whether it should run. Take this to the extreme. Can you imagine how ridiculous it would be that each time you called any program you had to confirm it? The only time when a program should ask for confirmation is when it is about to do something possibly dangerous and irreversible. For example, overwriting a file or bypassing the trash. And note that even these examples are about making a program do something specific. They are not about starting such programs. If a program only purpose is to do such dangerous thing, then it shouldn't be asking confirmation either. Indeed, Nautilus (Gnome file manager) will already by default ask you to confirm if you want to execute a script (or just open it in a text editor). And of course, this behaviour is configurable, giving the user the possibility of turning it off (note entry on Executable Text Files). 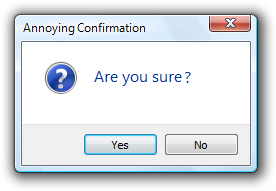 So do not add an annoying confirmation dialog to your script. 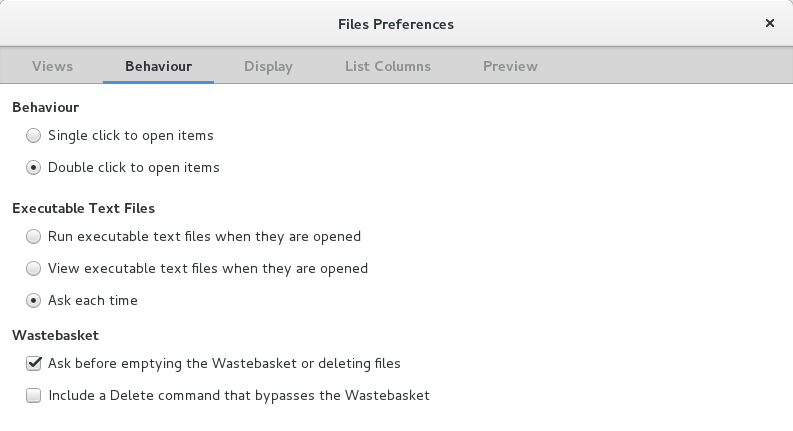 Configure your file manager correctly. And let your users do the same. yad --title=Question --image=dialog-question --text="Are you sure?" If OK was pressed we get a return code of 0, if Cancel was pressed we get a return code of 1. In this example we are using the variable $result which will be set to 0 if OK was pressed or to 1 if Cancel was pressed. For help with yad you can use man yad or yad --help-all but I found practical examples are easier to adapt. There are some here. yad is much more configurable and therefore more usable than zenity in my opinion. Not the answer you're looking for? Browse other questions tagged scripts or ask your own question. I've downloaded a .sh file - how do I install this? How to create a script that would execute a command at double-click? How to run an interactive script before xserver shutdown? What is causing a script to run when I change to a certain user? How to make a script accessible to root user?